Peterson speaking at the 2018 Young Women's Leadership Summit. Jordan Bernt Peterson (born June 12, 1962) is a Canadian clinical psychologist and a professor of psychology at the University of Toronto. He studies abnormal, social, and personality psychology. He is interested in the psychology of religious and ideological belief. He has criticised political correctness, Marxism, and postmodernism. ↑ "Jordan B Peterson". ResearchGate. Retrieved November 11, 2017. ↑ Tucker, Jason; VandenBeukel, Jason (December 1, 2016). 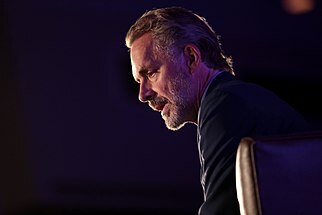 "'We're teaching university students lies' – An interview with Dr Jordan Peterson". C2C Journal. ↑ "Jordan Peterson: The right to be politically incorrect". National Post. November 8, 2016. Retrieved December 27, 2018. ↑ "Jordan Peterson, the obscure Canadian psychologist turned right-wing celebrity, explained". Vox. May 21, 2018. Retrieved December 27, 2018. ↑ "Postmodernism: definition and critique (with a few comments on its relationship with Marxism)". Jordan B. Peterson. This page was last changed on 16 March 2019, at 06:43.